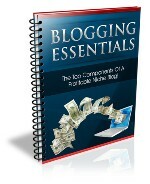 Anyone can make money with niche blogs, regardless of experience or skill. But in order for your blog to withstand the test of time and continue to be profitable over the long-haul, you need to make sure that critical components are in place right from the first step of the development phase. Not every blog ends up being a profitable endeavor and with good reason. In order for your blog to appeal to the masses, you need to make sure that you've done everything in your power to create an interactive community that specifically tailors to your market, while monetizing your blog for maximum profits. The Blog Essentials report reveals the most important components of a profitable blog, so that you can get it right the first time around!